Budtender Kelly Ryan has worked at 2020's Iron Street location since March 2016. "Everyone deserves to have a good experience with cannabis," she says. Photo credit: Matt Benoit. What makes Disneyland more than just an amusement park? What makes Starbucks more than just a coffee shop? What makes one cannabis retailer different than all the others? For 2020 Solutions, the distinction is in its genuine spirit of service. Budtenders at all three of their Bellingham locations go the extra mile to determine what you need to ensure that your best cannabis experience begins at 2020. Budtenders at 2020 locations are plentiful, helping customers find the best cannabis experience possible. Photo credit: Matt Benoit. Aaron Nelson, 2020’s Director of Actualization, says visiting a 2020 location is about never feeling rushed or crowded. It’s about feeling comfortable and interacting with professional, knowledgeable and caring budtenders. The flagship 2020 store at 2018 Iron Street was among the first dozen recreational dispensaries in Washington, opening in July 2014. A second 2020 store opened that October at 5655 Guide Meridian. The third location, at 4770 Pacific Highway, followed in April 2017. The company also has two Eastern Washington locations, in Ephrata and Sprague. Nelson says all five locations follow the same principles of service: They don’t just say they’re there to serve the customer, they truly embody it. Flat-screen monitor menus hang from the walls at 2020 Solutions’ Iron Street store. There are no shortage of options, and if overwhelmed, budtenders are happy to help narrow things down for you. Photo credit: Matt Benoit. With more budtenders per location than competitors, all 2020 stores are staffed to provide little to no wait time. They also offer demonstrations on equipment, from vaporizers to grinders. 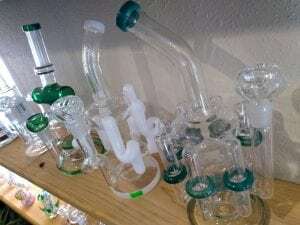 All 2020 stores carry a superb selection of glass pipes and, because of 2020’s buying strategy, can offer glass at lower prices. Their full-time buying team is always on the lookout for what’s new in the cannabis marketplace and they also take requests for specific products. The company also offers one of the most generous rewards programs in the industry, allowing members to earn 10 percent back on each purchase. That means for every $100 you spend, you get $10 to spend the next time you visit. “It’s kind of like having a bank account of money that you can spend on pot,” Nelson says with a laugh. 2020 Solutions has a wide variety of strains to choose from and employs a full-time buying team to see what’s new in the cannabis marketplace. Photo credit: Matt Benoit. Although legal marijuana feels commonplace to many Washingtonians, Nelson says some people are still trying to wrap their heads around it. That includes Nelson’s parents, who are in their 70s and once staunchly against cannabis. Nelson gave them a CBD-based (non-psychoactive) topical lotion for aches and pains. His father didn’t even want to take the sample home but he eventually relented, using it on his hips and shoulders. Realizing you can get relief from cannabis without getting high, Nelson says, is dawning on many people. There’s no shortage of reasonably-priced glass at 2020 Solutions’ three Bellingham locations. Photo credit: Matt Benoit. The 2020 budtenders put those who’ve never visited a dispensary – or even tried cannabis – at ease. They provide answers to questions in a safe and friendly space. The company’s budtenders pride themselves on being as up-to-date as possible in this ever-changing industry. Knowledge is a cornerstone of their business philosophy. 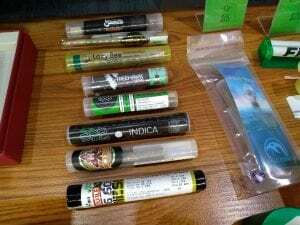 To that end, they now offer a weekly educational class, “Cannabis Talk,” every Wednesday evening at 6:45 p.m. at their North Bellingham location at 5655 Guide Meridian, next to the Hilltop restaurant. Weekly topics can be found on the events page of their website. Budtender Kelly Ryan has worked at 2020’s Iron Street location since March 2016. “Everyone deserves to have a good experience with cannabis,” she says. Photo credit: Matt Benoit. On a Friday afternoon, customers fill 2020’s Iron Street location, eagerly selecting products for the weekend. It looks like a well-lit jewelry store but glass countertops reveal pipes, lighters, bongs and bubblers instead of rings and pendants. On one wall, a large flat-screen monitor is so full of cannabis options it looks like an airport departures and arrivals board. 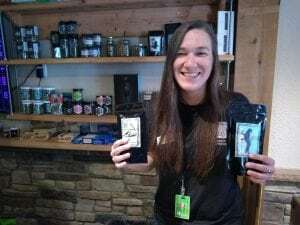 Standing in front of the monitor is 26-year-old budtender Kelly Ryan, who left an unfulfilling desk job several years ago to work in the cannabis industry. 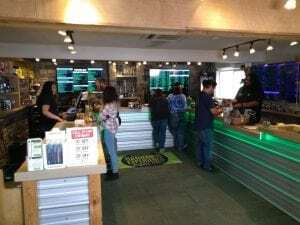 Ryan says 2020’s budtenders are quick to make first-time store visitors comfortable, helping them navigate the huge selection of products to find what’s perfect for them. For Ryan, one of the most fulfilling aspects of her job is seeing people overcome the negative side effects of opiates or pharmaceuticals with cannabis use. Additionally, she’s watched chemo patients regaining their appetite and says her father has found relief of his chronic knee pain by using a topical CBD cream. For more information about 2020 Solutions, call 360-734-2020 or visit www.2020-solutions.com.